"This is a common mistake people make regarding botulism. You state, "In ... read full review"
The temperatures and processing times used when canning vegetables and fruit are determined by many factors. 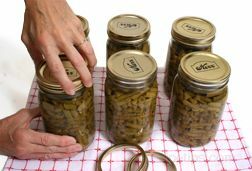 The food acidity, how the jars are packed, and canning method being used all determine the processing time, temperatures, and PSI when canning. The information below will help explain some of the factors that need to be considered when canning. 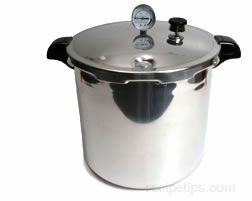 There are two basic methods for canning, boiling-water-bath and pressure canning. The method used is normally determined by whether the food being canned has a high acidity level or a low acidity level. High-Acid Foods: In high-acid foods, such as tomatoes, fruit and pickles, the growth of the Clostridium botulinum bacteria, which is heat resistant, is prevented by the high acidity level or the acidity allows the botulism spores to be destroyed quicker when boiled. This allows them to be processed using a boiling-water-bath at 212°F. The most common forms of spoilage microorganisms in acid foods are mold and yeast, which are destroyed by the boiling-water-bath. Tomatoes generally have an acidity level that is high enough to be considered an acid food but there are some varieties that have an acidity level that is slightly under the level required. Tomatoes that have a slightly lower acidity level can be made acidic by adding lemon juice or citric acid. The USDA suggests adding lemon juice or citric acid to all tomatoes to ensure acidity levels. They are then safe to process using the boiling-water-bath. Low-Acid Foods: Low-acid foods, such as vegetables, seafood, meats, and poultry must be pressure canned at 240°F to eliminate and prevent the growth of bacteria called Clostridium botulinum. The botulinum spores are very resistant to heat so processing at the higher temperatures provides a way to destroy these spores. 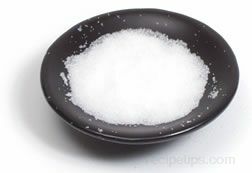 If the low acid foods were processed in a boiling-water-bath canner, they would have to be processed for a length of time ranging from 7 to 12 hours. 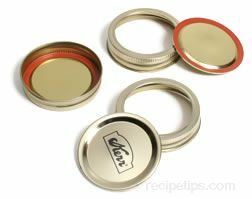 Processed at the 240° to 250°F using a pressure canner takes 20 to 100 minutes, depending on the type of food, size of jars, and the way it is packed. The chart below shows which foods are considered high acidity and which are low acidity. The size and shape of the jars. Less time is needed for smaller jars. Whether they have been raw packed or hot packed. The amount of liquid in the jars. More liquid will allow the jar contents to heat more quickly. The size of the food being processed. Smaller pieces will heat faster. The canning method being used. Pressure canning will be faster. The altitude in your area. See at the bottom of each chart for instructions on how much to adjust the processing time for altitudes above sea level. All of these factors determine the canning method, processing time and PSI (pounds per square inch) of pressure to be used. Be sure to follow all canning instructions very carefully. It is important to adjust the processing times when you are at a higher elevation. At sea level, water boils at 212°F but as the elevation increases water will boil at lower temperatures. The temperatures at which water boils at the higher elevations are not sufficient for killing bacteria. To compensated for the lower boiling temperatures, the processing time for boiling-water-bath canning needs to be increased and for pressure canning the PSI needs to be increased to destroy the harmful bacteria. Shown below are some charts with processing information and the adjustments that need to be made in processing time for higher elevations. If you are unsure of what the elevation is in your area, you can call your local county extension office to request this information. Leave 1/2 inch headspace on all high acid foods with two exceptions. When canning strawberry jam - leave 1/4 inch headspace. When canning grapes - leave 1 inch headspace. Over 20 Minutes Add 2 minutes per 1000 ft. in elevation. When using a pressure canner to process high acid foods, your processing time is much shorter than when processing with the boiling-water-bath. 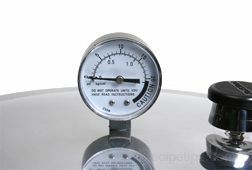 When processing at higher elevations the processing time can remain the same as what is used at sea level but the PSI (pounds per square inch) needs to be increased to make up for the lower internal temperature of the canner. Do not begin counting the processing time until the canner has reached its required pressure reading. Leave 1/2 inch headspace on all high acid foods listed below. At higher elevations, the steam in the headspace will expand more than at elevations below 1000 feet. To allow for this expansion, it is suggested that you increase the headspace by 1/8 inch for each 1000 feet above see level, not to exceed 1 inch on pint jars and 1 3/4 inches on quart jars. 2000 ft. 2001 to 4000 ft. 4001 to 6000 ft. 6001 to 8000 ft.
Apples Hot 8 8 6 lb. 7 lb. 8 lb. 9 lb. Pears Hot 10 10 6 lb. 7 lb. 8 lb. 9 lb. Rhubarb Hot 8 8 6 lb. 7 lb. 8 lb. 9 lb. Tomatoes - Juice (with acid added) Hot 20 20 6 lb. 7 lb. 8 lb. 9 lb. Hot 15 15 11 lb. 12 lb. 13 lb. 14 lb. 40 6 lb. 7 lb. 8 lb. 9 lb. Raw 25 25 11 lb. 12 lb. 13 lb. 14 lb. Tomatoes - Crushed (Quartered) - No Liquid Added (with acid added) Hot 20 20 6 lb. 7 lb. 8 lb. 9 lb. Leave 1 inch headspace on all low acid foods listed below with the exception of lima beans, raw packed. 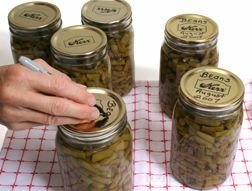 When using the raw packed method for canning with quart size jars, increase the headspace to 1 1/2 inches for small beans and 1 1/4 inches for large beans. At higher elevations, the steam in the headspace will expand more than at elevations below 1000 feet. To allow for this expansion, it is suggested that you increase the headspace by 1/8 inch for each 1000 feet above see level, not to exceed 1 inch on pint jars and 1 3/4 inches on quart jars. Artichokes (Jerusalem) Hot 25 25 11 lb. 12 lb. 13 lb. 14 lb. Beets Hot 30 35 11 lb. 12 lb. 13 lb. 14 lb. Cabbage Canning is not recommended. Best kept in cold storage. Eggplant Canning is not recommended. Mushrooms Hot 45 11 lb. 12 lb. 13 lb. 14 lb. Peppers Hot 35 11 lb. 12 lb. 13 lb. 14 lb. Potatoes, White Hot 35 40 11 lb. 12 lb. 13 lb. 14 lb. Pumpkin Hot 55 90 11 lb. 12 lb. 13 lb. 14 lb. Spinach and Other Greens Hot 70 90 11 lb. 12 lb. 13 lb. 14 lb. Squash (summer) Canning is not recommended. Best eaten fresh. Squash (winter) Hot 55 90 11 lb. 12 lb. 13 lb. 14 lb. Sweet Potatoes Hot 65 90 11 lb. 12 lb. 13 lb. 14 lb. "This is a common mistake people make regarding botulism. 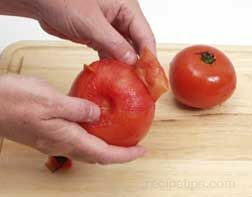 You state, "In high-acid foods, such as tomatoes, fruit and pickles, the growth of the Clostridium botulinum bacteria, which is heat resistant, is prevented by the high acidity level or the acidity allows the botulism spores to be destroyed quicker when boiled. This allows them to be processed using a boiling-water-bath at 212°F." You actually have this backwards. It is the SPORES that need the super high heat of pressure canning to kill them so they can't produce the cells that turn to the deadly bacteria, which IS easy to kill with heat. 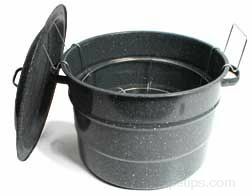 This is why all home-canned low-acid foods should be boiled for 10 minutes before tasting or eating, because if the bacteria did grow in the low-acid anaerobic environment, they would be killed by boiling."